Mint Julep drinks are one of my favorite things to get at Disneyland. They are perfect for a hot summer day with a little bit of mint, lemon, and lime flavors. You can find these refreshing drinks at the Mint Julep Bar in New Orleans Square. I love enjoying one of these drinks and an order of beignets as I give my feet a break at Disneyland. Now I don’t have to wait for a Disney trip – I can make them at home, and they are super easy to throw together. 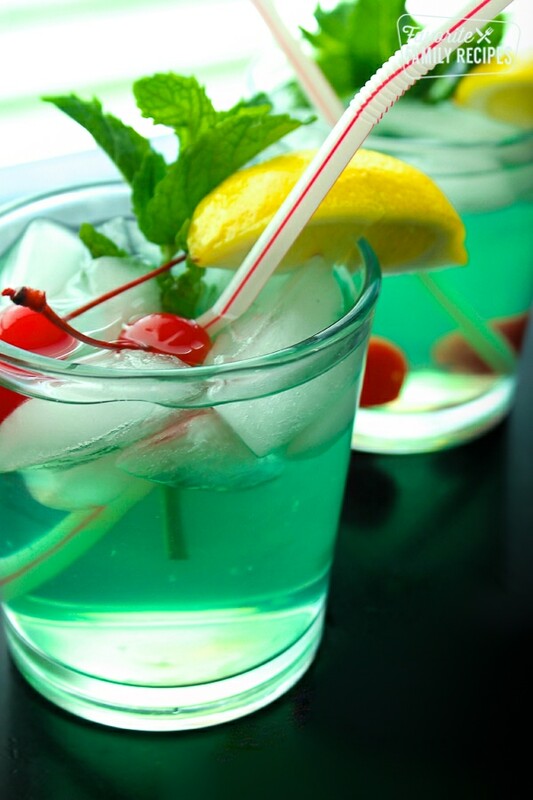 These are non-alcoholic Mint Julep drinks so they are perfect for all ages, my kids love them! This Mint Julep recipe is a copycat of the non-alcoholic Mint Julep served in New Orleans Square at Disneyland. A traditional Mint Julep is a cocktail made with bourbon, mint, water, and sugar. It is a popular drink in the southern states of the United States where it was once thought to have medicinal properties. The Mint Julep became the official drink of the Kentucky Derby in 1938. Disneyland created a non-alcoholic version of the Mint Julep to bring a taste of the South to New Orleans Square. This version incorporates fresh lemon and lime flavors with mint over ice. It has become one of Disneyland’s most famous drinks. In addition to the Mint Julep Bar in New Orleans Square, you can also order these delicious drinks at the Blue Bayou Restaurant, Cafe Orleans, and the French Market which are all located in New Orleans Square in Disneyland. Most Mint Julep ingredients can be found in your local grocery store in the freezer section. The hardest ingredient to find for me was a bottle of creme de menthe syrup. None of my local grocery stores carried the flavor. Normally you can find these syrups near the coffee section. Luckily a lot of coffee shops sell the flavored syrups so I was able to get a bottle from Moxie Java. You can also find Creme de Menthe Syrup on Amazon. The maraschino cherry, mint leaf, and lemon wedge garnish, and a clear cup are essential to making the Mint Julep look and taste amazing! If you would rather just go to Disneyland to try one of these drinks at the Mint Julep Bar, you can get a great deal from GET AWAY TODAY on your next trip! We use Get Away Today for discounts on booking all our Disney Vacations. They have awesome Lay Away Plans too that make saving for your next adventure so easy. Learn more about all of our favorite Disneyland foods HERE! Add sugar and water to a large sauce pan. Bring the mix to a boil, stirring occasionally. Cool for 5 minutes, then pour mixture into a large pitcher. Add the creme de menthe syrup, and frozen lemonade and limeade concentrates. Add a little green food coloring and stir to mix. Pour over a glass with some ice and garnish with lemon wedges, mint sprigs, and cherries. Such a sweet drink, love the mint in it! What brand of creme de menthe syrup do you use? I’ve found that most brands taste about the same, I would use any brand that you can find available. It’s a little hard to find. Check in the liquor section and the ice cream section of your local stores. I’ve found it both places. So I was helping my 16-yr-old daughter plan her birthday party (which is supposed to be the event of the season) and she is INSISTING that we serve mint juleps at the party. She loves this recipe so much! Of course, she thinks Emily should make them for us, but I said I could probably handle it. Thank you! That is awesome! Your 16 year old has good taste. :). You’ll have to let me know how the party turned out. Happy sweet 16!! Sorry it didn’t turn out well for you! What kind of Creme de Menthe did you use? Maybe that has something to do with it? Is the Disney Mint Julep a herbal tea? It’s more like a minty lemonade. Hope this helps! Not like Disneyland – better. This is more concentrated and intense. Disney’s Mint Julep is watered down.